Following the sinking of the Titanic, newspapers were filled with stories of those who had missed boarding the ship for various reasons. Northern Michigan’s Sault Ste. Marie Evening News carried this story on April 20, 1912. By the following week, more than 118,000 claimed to have cancelled their reservations on the doomed ship or changed their plans at the last minute. However, seven well-known gentlemen did, indeed, miss Titanic. One of them was Milton Snavely Hershey. He founded the Hershey Chocolate Company and produced the first Hershey Bar in 1900, followed by Hershey Kisses in 1907. The chocolate factory was in the center of Pennsylvania dairy farmland, but with Hershey’s help, houses and other businesses soon surrounded the factory and eventually became the town of Hershey. 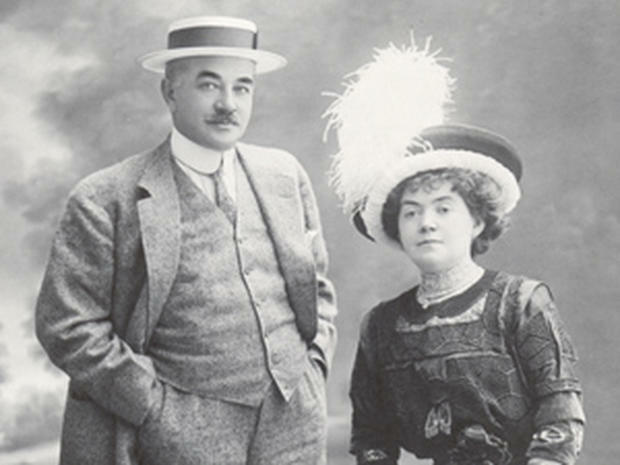 As the company expanded, Hershey and his wife, Kitty, traveled extensively. In 1911, while planning a European business trip, he booked a suite on Titanic’s maiden voyage back to New York. The Hershey archives holds a copy of the check Milton Hershey sent as a deposit to the White Star Line. When April came and the Hersheys were in Europe, a business matter at home forced them to change their plans and take an earlier departure for New York aboard the German liner, Amerika. On the night of April 14, 1912, as Titanic crossed the north Atlantic Ocean, several ships sent warnings of ice to Titanic. One of the ships was the Amerika, with Milton and Kitty Hershey aboard. Their ship reached the United States without incident, but the Hersheys soon learned of Titanic’s fate. Next time, we’ll see what famous author just missed the Titanic. photo credits: cbsnews.com, pennlive.com, smithsonianmag.com.